Pentas lanceolata is a small shrub that will grow as far south as Melbourne where it is sold as and can be grown as an annual, but it does require a warm frost free position to survive that far south, so best suited to Sydney and further north to tropical and sub tropical climates where it is more hardy. Lovely green foliage and flowers ranging from pink to red depending on cultivar. 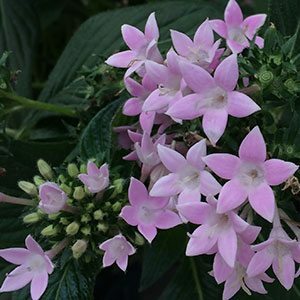 A new release is Pentas lanceolata ‘ Lilac Lady’ lovely clusters of ‘lilac pink’ star shaped flowers. A few cultivars around with variegated or ‘striped foliage’ but still with the lovely star shaped flowers. The small bush will reach around 1- 1.5m and it grows well in a humus rich soil in full sun to part shade. In cooler climates a protected sunny position is best. Flowering from summer though to autumn, they can be pruned to shape in spring as the weather warms up. Excellent for attracting nectar loving birds and can also be grown in containers or indoors. Aspect – Full sun to Light Afternoon Shade. Plant Type – Perennial in warmer climates, annual in cooler areas. Height – 1m to 2m easily pruned. Foliage – Green, some cultivars with variegated foliage . Flower – White to pink and red. Features – Attracts Birds and Bees, good cut flowers. Landscaping Uses – Grow in containers, as a feature in the border, as a low hedge or screen in warmer climates. It is important realise that many of these plants are versatile,while others are difficult to grow in any but a tropical situation. 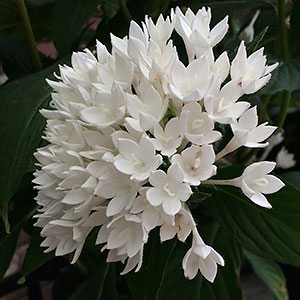 However we have seen fragipani plants growing indoors in a pot in cool areas of Victoria, so if you are keen to grow tropical plants in cool climates you can certainly give it a try.